Become a Citizen Scientist at Mount Auburn Cemetery! Phenology refers to the study of recurring plant and animal life cycle stages and the relationship of these life cycle stages to weather and climate. Join us in gathering phenology data to better understand how climate disruption is impacting our urban wildlife refuge. All current citizen scientists and new volunteers are encouraged to attend one classroom training and one field training. I am a retired teacher living nearby and am interested. What is the time commitment required for volunteers? Where is the training? We ask that volunteers collect data once per week through the spring and again in the fall. The classroom trainings will be held at Story Chapel – March 12 or 13, 10:00am-11:30am. 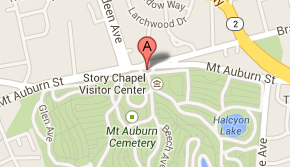 We also ask that everyone meet outside of Story Chapel for the field trainings – March 19 or 20, 10:00am-11:30am. Hi Michael. I am doing an inventory of the birds at Magazine Beach and would love to be involved with your project. Sign me up. If you’re interested in becoming a Citizen Scientist at Mount Auburn you can reach out to Paul Kwiatkowski, our Wildlife Conservation & Sustainability Manager at pkwiatkowski@mountauburn.org. He can answer all your questions about the project!